Well the spring/summer 2014 collections within menswear are truly underway as Milan Menswear takes to the catwalk this weekend. Before all that future seasonal shows of what our partners or peers are wearing next spring/summer there, is still trends to be talked about regarding this year’s spring/summer clothing and accessories. It’s something I’ve only recently been drawn towards regarding, my usual mantra of wearing own certain trends at the by own accord. All in all leads me to explore this trend which has been seen on Sarah Jessica Parker most recently which is the ‘Neon-Camo Clash’. You may be wondering what unearth right? Well it’s been adopted throughout the blogosphere most recently seeing its followers wearing camouflaged pants, trousers, jackets, or parkas in an outfit which features the neon colour palette through shirts, skirts (maxi and midi) to the accessories of clutches and jewellery. I’ve been investigating this trend within our ‘High Street’ and I have picked out the top pieces which will able you to wear this trend as it becomes this summer’s coolest warobe update. 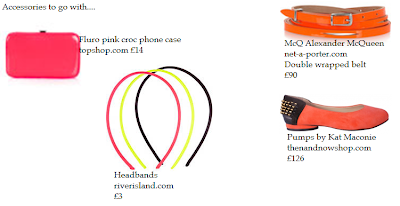 There are some investment pieces for accessories too. First up is the top three pieces to own which when wearing this trend would a lot easier because, you can make this as your main piece of camouflage. Then add your tees, trousers, and denim shorts etc. Yet don’t be afraid to throw another colour into the mix. If you’re not too keen to making it flat of trying this trend head to toe with a camouflage jacket, with black tee, neon necklace, and neon colour blocked trousers. 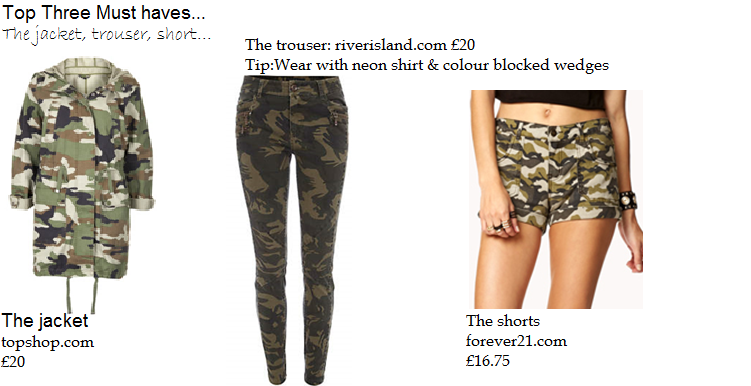 Or either a midi neon colour blocked skirt, a tee, and camouflage jacket. There is another way which you can do this trend…. Accessories are the answer! 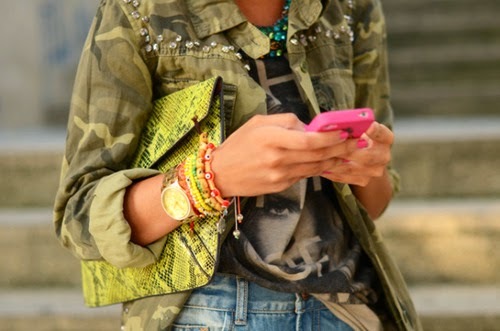 Try experimenting with an accessory such as a neon bag, necklace, or bracelet which will still make you on trend. Add your accessory with a white tee, denim shorts, and a camouflage jacket….